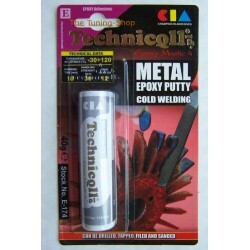 EPOXY PUTTY There are 4 products. 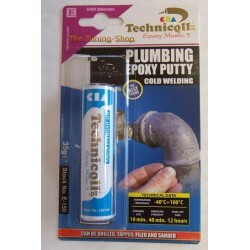 A BRAND NEW1 x 35g BLUE PLUMBING EPOXY PUTTY FOR CENTRAL HEATING RADIATORS, PIPES, REFRIGERATION UNITS, SIPHONS etc HIGH QUALITY PRODUCT DESCRIPTION: Plumbing Epoxy Putty is a two component adhesive of the plasteline consistency designed for removing leaks in devices and cooling, heating and water-sewage installations. May be used on wet surfaces. A BRAND NEW1 x 35g LIGHT GREY UNIVERSAL EPOXY PUTTY RAPID 10 MIN FOR METALS, CERAMICS, PLASTICS, GLASS, WOOD HIGH QUALITY PRODUCT DESCRIPTION: Universal epoxy putty is a two component product designed for quick repairs of elements made of: wood, glass, ceramics, plastics and metals.